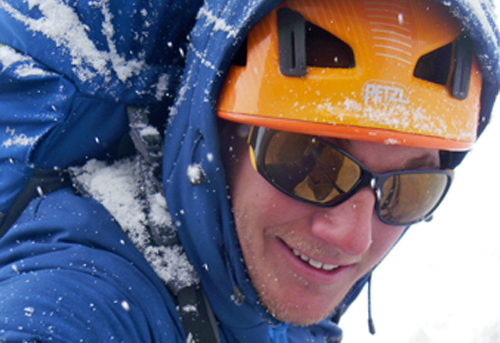 Alan has been guiding since 2008, and is on his way to full IFMGA certification. Climbing has taken Alan to the Alaska Range, Andes, Caucasus, Canadian Rockies, Sierra, Himalaya and limestone covered Greek Islands. Visiting new places, and opening up new routes is what keeps Alan excited to climb. He has completed over 20 first ascents in various styles of climbing including first peak ascents in the Himalaya. When Alan is not on an expedition, he can probably be found climbing or binging on Netflix with his wife in Salt Lake. For the fall of 2014 Alan has been awarded the Lyman Spitzer Cutting-Edge Climbing Award to return to the Himalaya and attempt a 4,000′ wall that begins at 18,500′ and culminates just shy of 7,000 meters.